Aqua Planet Zone, is the fifth zone of Sonic Chaos for the Sega Game Gear / Sega Master System. In keeping with the other stages of this game, Aqua Planet consists of two standard Acts followed by a shorter, third Act which contains the boss. Geographically, this Zone is located on South Island (as is the rest of Sonic Chaos). 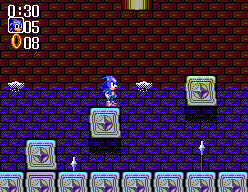 Why it's called Aqua Planet is something of a mystery; but it's certainly aqua, with underwater sections aplenty - reminiscent of Hydrocity Zone from Sonic 3 and Knuckles. The Zone consists of crumbling, half-submerged ruins, from which ruby-tinted offshore oil rigs can be glimpsed in the background (these are presumably the Doctor's work). Aqua Planet is a stormy zone too, as the roiling clouds will attest. This page was last edited on 28 September 2018, at 07:41.